June 2018 Paper Pumpkin Kit "Broadway Star" Images©Stampin' Up! The Paper Pumpkin team chose the June kit as a stepping stone to the annual catalog. This kit coordinates very well with the Broadway Bundle Suite and you can fined all the great products on p.68-69 in the annual catalog. Wooh! So this Thursday Treasure is all about Paper Pumpkin. I create swaps for two different groups and I chose to use the June Paper Pumpkin kit and the Broadway bundle for my July swaps. I created one card per the instructions in the kit but I also created an alternative for my swaps. I really love all the gold, black and white in this bundle. Card measurements:4 1/4" x 5 1/2"
1. Cut thick whisper white cardstock 8 1/2" x 5 1/2", score @ 4 1/4"
2. Cut broadway bound designer series paper (DSP), 3" x 3"
3. Cut black card stock 3 1/8" x 3 1/8"
4. Stamp sentiment on whisper white card base using picture as your guide. 5. Attach DSP to black card stock piece using snail adhesive. 6. Attach dsp layer to card base using the snail adhesive. 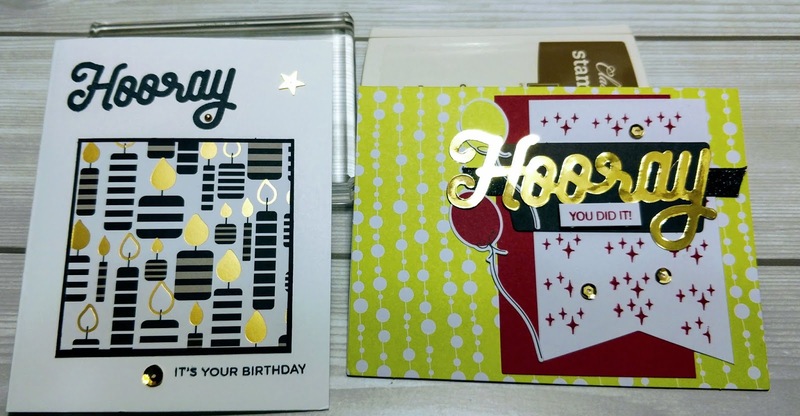 Add metallic pearls and sequins to card for that extra pizzazz. Voila your project is complete! Just think it only took about an hour to create this super cute alternative. If you feel this something you would like to do, check out the Blooming Savings Promotion. I guarantee you will love being a paper pumpkin subscriber. Savings are blooming, and there’s no time like the present to subscribe to be part of the Paper Pumpkin experience. Checkout the details below. The total cost of first kit is $9.96 USD/$13.23 CAD. The membership will continue at full price starting in September. Just think you can have an all-inclusive craft kit delivered directly to your mail box for just $9.95. Give it a try and see how you like it. I guarantee you will love being a paper pumpkin subscriber. Stop and pick the Blooming Savings! 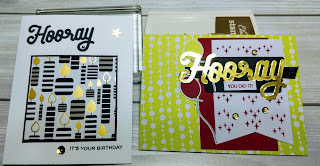 Thursday Treasure: Stampin' Up "Broadway Birthday"
Our team's weekly challenge was to create a project using a new stamp set from the annual catalog. 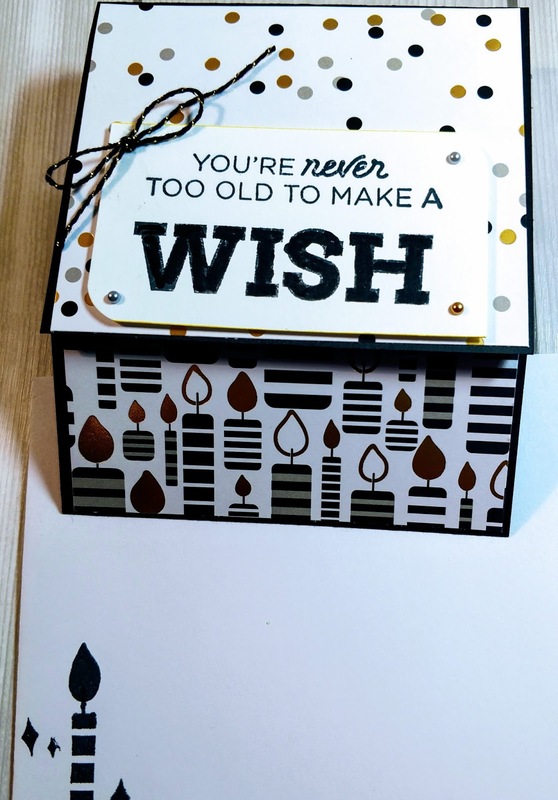 I chose the Broadway Birthday Stamp set on page The inspiration for this card fold came from the March 2018 Paper Pumpkin Kit. I enjoy making fun fold cards, because the recipient an extra special treat when opened. Card measurements: 5" x 3 1/2"
1. Cut black card stock 11" x 4 1/4", score 2 1/4" & 3 1/2"
2. Cut broadway bound designer series paper, 2 1/8" x 4 1/8" & 4 1/8" x 3 9/16"
3. Cut whisper white card stock 2" x 3 1/2" & 4 1/16" x 5 1/16"
4. Stamp sentiment on whisper white cardstock punch ends with detailed trio punch. 5 Attach DSP to card base using snail adhesive. 6. Attach sentiment layer to card base with dimensionals. Add metallic pearls to sentiment layer. I made a bow using some twine from the June 2018 Paper Pumpkin kit. Embellish envelope to give your project that extra pizzazz! CODE: 93UK2K9P to receive the new cleaning tool, "Simply Shammy". Free set of ink pads (10 total) when you buy the Starter Kit. Go ahead...just click the link and join Renee's Paper Gems. Stampin' Up! is offering an amazing special! Our challenge was to create a project using the ion-colors. I have always wanted to create a note card set using the new in-colors. I CASEd this card from page 123 in the catalog. I really had an awesome time creating this project. I decided to use all the new colors are Lovely Lipstick, Call Me Clover, Grapefruit Grove, Blueberry Bushel and Pineapple Punch. I must admit my favorite is Blueberry Bushel. This card is a perfect for mass card making. Card measurements: 5' x 3 1/2"
1. Stamp daisy image on whisper white cardstock using all the colors. 2. Cut using the daisy punch and set them aside. 3. Stamp daisy image, leaf image and sentiment on card base using the picture as your reference. 4. Attach daisy punch over the daisy image on card base counter clockwise using snail adhesive. Our team's weekly challenge was to create a project using the colors Dapper Denim, Berry Burst Daffodil Delight. One of my favorite things is to look at the images in a stamp set and let my creativity flow outside the box; by creating my own designer series paper. The Perennial Birthday stamp set has some cute images. 1. Cut whisper white card base 8 1/2" x 5 1/2" and score @ 4 1/4"
4. Create custom designer series paper using images from the stamp set. 6. Use snail adhesive and attach custom designer series layer to daffodil delight card stock. Then attached the complete layer to the card base. 7. Use dimensionals to attach the sentiment layer to the card base. 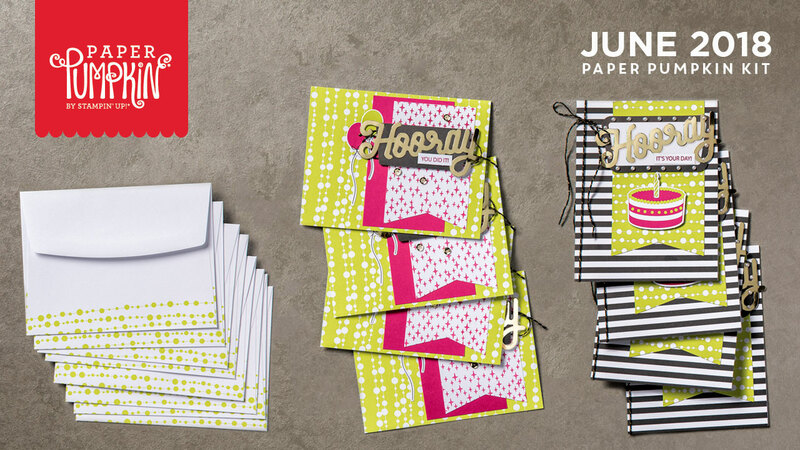 Add embellishments to give your card that extra pop. 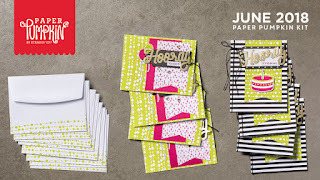 Embellish envelope to give your project that extra pizazz! 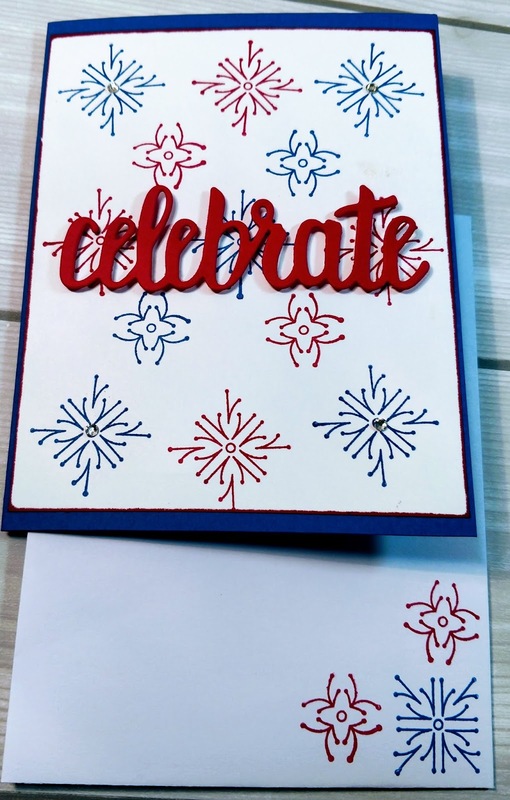 On the Fourth of July our team had a Stampin' Up! catalog scavenger hunt. We were asked to find products that could be used to make a 4th of July project. 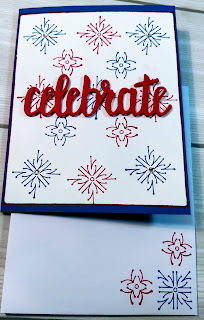 I chose two products the "Around the Corner" stamp set and the "Celebrate You" Thinlits dies. 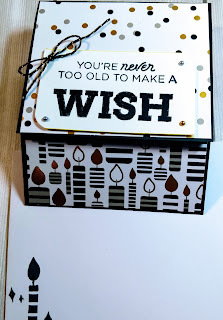 I decided to use two of the new in-colors Blueberry Bushel and Lovely Lipstick to make this super cute card. I had so much fun participating in this scavenger hunt and creating this project using these products. 1. Cut blueberry bushel card base 8 1/2" x 5 1/2" and score @ 4 1/4"
3. Cut lovely lipstick card stock 3" x 6"
4. Stamp images on whisper white using the picture as your reference. 5. Cut sentiment using the "Celebrate" thinlit dies with the big shot. 6. Attach whisper white background DSP to card base using the snail adhesive. 7. Use dimensionals to attach the sentiment layer to the card base. Add clear rhinestones to give your card that extra pop.